I got an early Christmas gift from my mother, since I’m going to spend Christmas in France. I got three beautiful sets of pencils: Cretacolor – Soft Graphite, Charcoal and Monolith, and I couldn’t wait to make my next drawing. This time I chose Louise Brooks again, because she is my greatest role model. It was the first time I used Monolith and Charcoal pencils. I drew the contours with my trusty 0.7 mm pencil, the soft shadows with Monolith – 4B, 6B, 9B and the dark shadows with Charcoal Medium pencil. 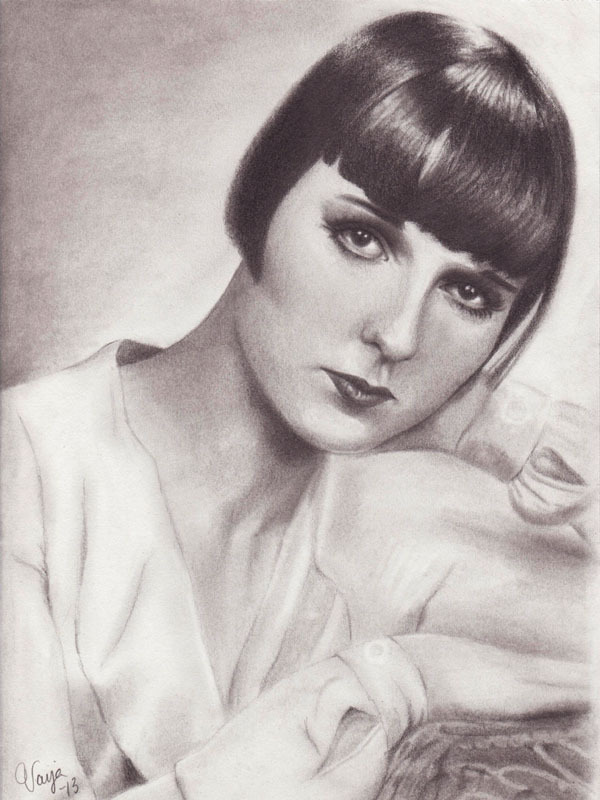 Finally I have my greatest idol, Louise Brooks, in my portfolio. I finished the drawing of her tonight. In this drawing I practiced to make soft lines and shadows, to get the right film grain/20s feeling to it. I drew the lines with a 0.7 mm pencil and for the shadows I used Cretacolor soft graphite pencils, B, 2B, 9B.